All organisms on Earth evolved from a common ancestor, so all organisms use DNA as their molecule of heredity. At the chemical level, DNA is the same whether it is taken from a microscopic bacterium or a blue whale. As a result, DNA from different organisms can be “cut and pasted” together, resulting in “recombinant DNA”. The first recombinant DNA molecule was produced in 1972 by Stanford researcher Paul Berg. Berg joined together DNA fragments from two different viruses with the help of particular enzymes: restriction enzymes and ligase. 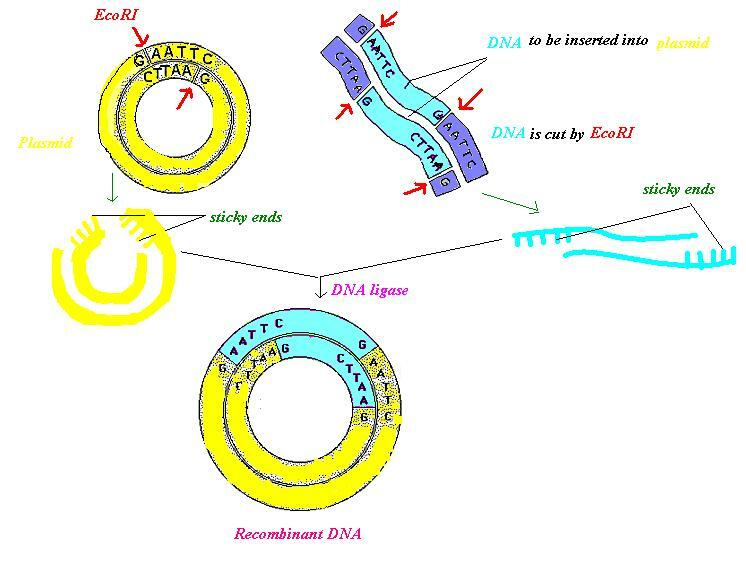 Restriction enzymes (such as EcoR1 in the figure below) are like “molecular scissors” that cut DNA at specific sequences. If the DNA from the different sources is cut with the same restriction enzyme, the cut ends can be joined together and then sealed into a continuous DNA strand by the enzyme ligase. In 1973, the first organism to contain recombinant DNA was engineered by Herb Boyer (UCSF) and Stanley Cohen (Stanford University). Together they introduced an antibiotic resistance gene into E.coli bacteria. Notably, they also produced bacteria that contained genes from the toad Xenopus laevis , which showed DNA from very different species could be spliced together. Paul Berg was awarded the 1980 Nobel Prize in Chemistry “for his fundamental studies of the biochemistry of nucleic acids, with particular regard to recombinant-DNA”. The ability to cut, paste, and copy molecules of DNA was not only a watershed moment for scientific research but spawned an entire industry built on genetic engineering. Genetech, the first biotechnology company, was founded by Herb Boyer in 1976. By 1982, the FDA approved Genetech’s first successful product, a synthetic form of human insulin produced by bacteria that were engineered to contain the insulin gene. Today recombinant DNA technology is used extensively in research laboratories worldwide to explore myriad questions about gene structure, function, expression pattern, regulation, and much more. One widely used application involves genetically engineering “knock-out” animals (typically mice) to contain a non-functional form of a particular gene of interest. The goal of such experiments is to determine gene function by analyzing the consequences of the missing gene. While knockout mice are generated to answer questions in many different fields, they are particularly useful in developmental biology and have led to an understanding of some of the essential genes involved in the development of an organism from a single fertilized egg. Recombinant DNA techniques are also a cornerstone of the biotechnology industry. One example is the generation of genetically engineered plants to produce an insect toxin called Bt toxin. The Bt gene is derived from a bacterium called Bacillus thuringiensis and produces a toxin that disrupts gut function in the larvae (caterpillars) of certain insects that are crop pests. The gene that produces Bt toxin is introduced into such plants by recombinant DNA technology, and results in the selective killing of crop-feeding insects. This development has had a major economic impact and reduced the expenses of pesticides used per year and has increased the longevity and success of several crops.